Growing up, from grammar school to college, I've always had freshwater tanks. 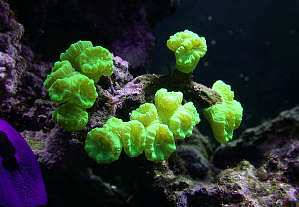 I wanted to get involved with marine tanks in high school, but did not have the money. After college, I found I did not have the free time to properly take care of a tank the way I wanted to. Finally, after my life settled down a bit, I decided to get back into the hobby. This time I wanted to do a full reef set-up. So, after a many months of planning, and much reading, I bought a tank. Seventeen months later, I have the thriving reef aquarium you see here. 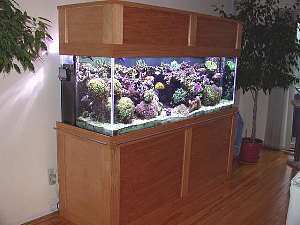 The tank is an AGA 180 gallon reef-ready model measuring 72" x 24" x 24" and was set up in April of 2001. 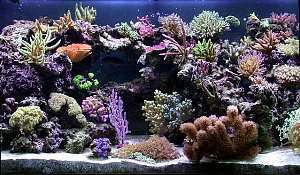 The basic design is a modified Berlin set-up using live rock and live sand with a skimmer. Two refugia and a sump add an extra 70 gallons to the total system volume, making the overall capacity about 250 gallons. Approximately 250 lbs. of Southdown sand make up the 3.5 - 4" DSB in the main tank. The rest of the biological filtering system for the tank is comprised of 260 lbs. of Fiji and Tonga branch live rock. I built the stand and canopy myself. The stand is made with 2 x 4 bracing. The exterior is birch with the borders made from pine, which has been stained and finished. The entire front of the stand is removable. The front panel is attached with industrial strength Velcro, which holds the front very securely to the stand. I really wanted the front of the stand to look very clean, with no doors visible. By doing this, I also found it very easy to work under the tank. The canopy is made with 2 x 2 bracing using the same birch/pine exterior. All inside surfaces of the cap have been primed and painted gloss white to maximize light reflectance. The interior seams were sealed with silicon sealant, as well. The back of the canopy is semi-enclosed, meaning only the bottom 4 1/2" is open to allow for the plumbing and much needed ventilation. More details and pictures of its construction can be found here. Circulation in the tank is provided by running the return lines through two ¾" Sea Swirls. Two 1-inch drains bring the water to the refugia in the basement, (approx. 10 feet), directly below the tank. Each overflow drains directly into each refugium. 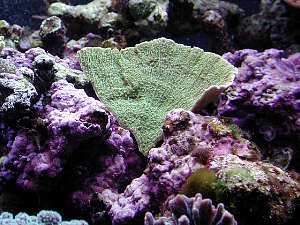 One refugium, a 20 gallon, holds macro algae for nutrient export. The second, a 29-gallon tank, has a 6" DSB and a few pieces of live rock for denitrification. The refugiums are relatively new to the system and were added in May of this year. 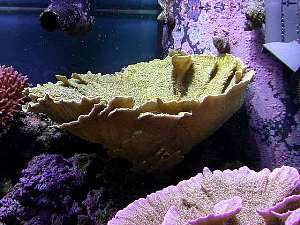 Both refugia then flow into a Lifereef sump containing sections to hold carbon, if necessary. 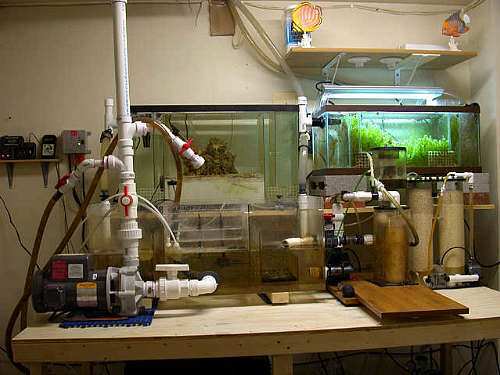 A Lifereef VS2-24 skimmer, powered by a Dolphin DP-1200 external pump, is plumbed directly into the sump. 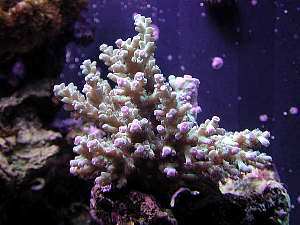 Occasionally, ozone is used, and is injected through the Venturi valve on the skimmer. From the sump the water enters the return pump, a Sequence 6000, and then goes back upstairs to the Sea Swirls in the main tank. Future plans to improve circulation include adding a closed-loop system to the tank, using an Amp Master 3000 pump. I am currently experimenting with different positions for the water return lines by using powerheads, before I plumb the closed-loop, and it is for that reason that you will see some power heads in the tank in some of my tank pictures. The lighting in the tank consists of three 250 watt 10,000K single ended Ushio metal halide bulbs, which are powered by PFO 250 watt HQI ballasts. Two 140 watt 5' Super Actinic URI VHO bulbs supplement the metal halide lighting and are powered by an Icecap 660 electronic ballast. Moonlight simulation is achieved using two 11 watt incandescent blue bulbs running on an X-10 module and is controlled by Bill Esposito's eLightMaster program. The refugium lighting is on a semi-reverse daylight lighting schedule, from 10 AM to 5 AM, which equals 19 hours a day. 07:30 AM: MH turns on right to left over a period of 15 minutes to simulate sunrise, then turns off shortly after VHO comes on. 08:40 PM: MH turns off right to left over a period of 15 minutes to simulate sunset. All of the top-off water is filtered through an AquaFX Barracuda 4 stage 100 gpd RO/DI unit. I store about 25 gallons of make up water in a covered container, which is aerated with a small bubble stone. 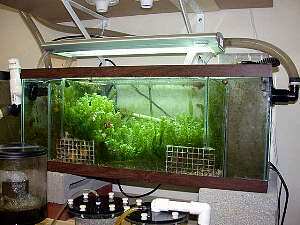 The tank evaporates between 3-5 gallons a day. During the day, a Lifereef float switch turns on a powerhead to deliver makeup water as needed. Between the hours of 10 PM to 9 AM, all makeup water goes through a separate powerhead that feeds an EcoTech Marine Nilsen reactor into the sump. The main intent in adding a Nilsen reactor, and using it in this manner, was to assist in keeping the pH constant during the nighttime hours, when the pH has a tendency to drop. The extra calcium the kalkwasser provides, which helps supplement that provided by the calcium reactor, is a side benefit. Since adding the Nilsen reactor, my pH has remained very stable; 24-hour fluctuations are on average less than 0.1. I started these from a petri dish culture of Tetraselmis micro algae that I purchased from Florida Aqua Farms. I now have five 2-liter bottles of phytoplankton growing at any one time. 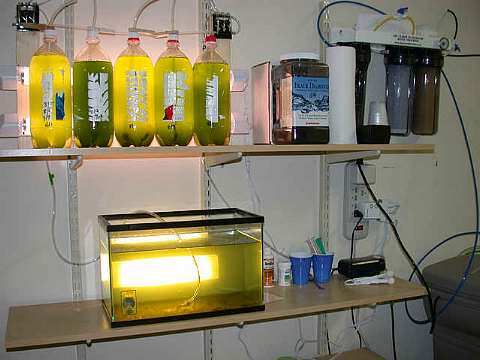 Two 24-inch standard florescent bulbs are used to light the phytoplankton. I use so much phytoplankton that I usually need to conserve it. On some days, I'm forced to use less phytoplankton in the rotifer cultures because one of the bottles is not ready to be harvested. Rotifers are cultivated in a 5-gallon tank on a shelf below the phytoplankton to help reduce the chance of cross-contamination. I feed the rotifers about 10 oz. of phytoplankton a day. Most of the time the rotifer culture is pretty dense. I also do a weekly 1-gallon water change, if I can fit it into my schedule. The rotifer tank can get very dirty, so I keep an extra 5-gallon tank around. 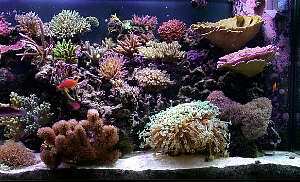 Once every 4-6 weeks I swap out the whole tank for a clean one with new Instant Ocean salt mixed in. Bi-monthly: 20 gal water change. Run Carbon for 48 hours. 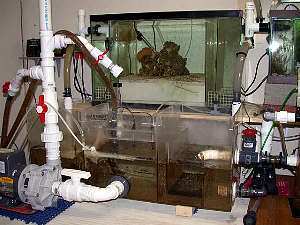 In order to meet the large calcium requirements of the tank, I'm using a dual stage calcium reactor built by Coralhound. A total of roughly 15 lbs. of Knop Korallith reactor media is used in both chambers. I recently upgraded from a 5 lb. to a 10 lb. CO2 tank, and hopefully, this should last about 6 months before a refill is needed. An Aqua Logic 1/3 HP in-line Delta Star titanium chiller keeps the temperature rock steady, even during some nasty heat waves. During the winter, two 300 watt Won titanium heaters located in the refugia help keep the temperature from dropping. A Medusa dual stage controller performs temperature control. I keep the temperature at 79 in the winter and bring it gradually up to 82 for the duration of the summer. In the event of a power failure, I use a Powerware Prestige 6501PSE UPS for temporary power to the Sequence 6000. The UPS will last about 15 minutes, which is generally enough to make it through any temporary power failures or brownouts. In the event of an extended power outage, I have a gas-powered Generac generator on standby. So far, I have yet to put it into service. 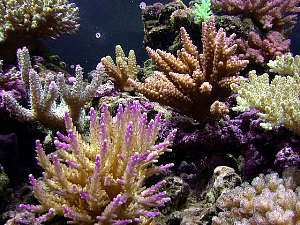 The tank houses some 60 or so corals. 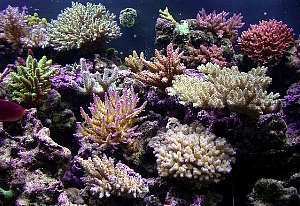 Over 35 different SPS corals, including various Acropora, Montipora, and Pocillopora cnidarians, call my tank home. 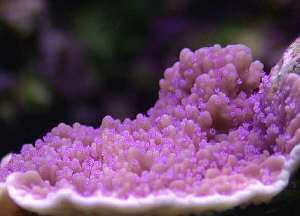 The LPS population is based primarily upon species in the Euphyllia family, with some additional Physogyra specimens added to make my wife happy. 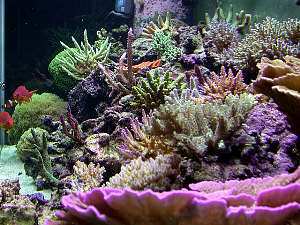 The tank is predominately hard stony corals, but there is a large leather coral, a few gorgonians, and some small patches of Xenia. The Xenia has been sequestered to the sand bed, so I can keep it in check. 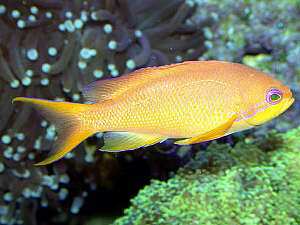 My reef tank also is home to 13 fish, including anthias, a mandarin, and even a Niger trigger. All my resident fish are model reef citizens. 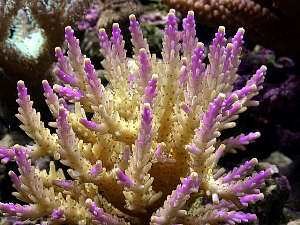 They exhibit no unruly behavior against any of the corals, or one another...so far. The inverts are a plenty: urchins, shrimp, crabs, snails, worms, cucumbers, mini-bristle stars and mini-sea stars. 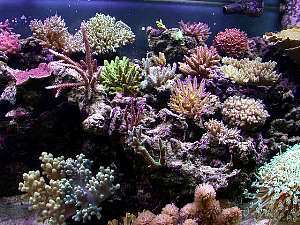 At night, bristle worms, peanut worms, and copepods are readily seen scurrying among the rockwork. Additionally, hundreds of Rissoid snails come out and are visible on the sand bed and rocks only at night. Feather dusters seem to occupy every nook and cranny available. 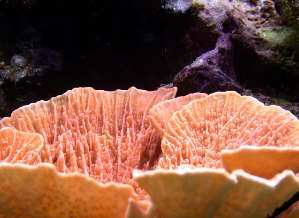 I find small clusters of feather dusters all over the tank, even in the corners of my refugium. I have also begun to find a significant amount of sponges in the back corners and under rocks. 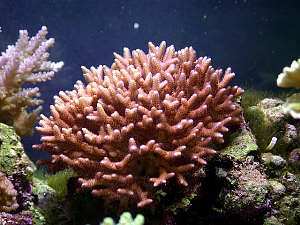 Overall, the growth of my corals ranges from marginal to staggering. Some corals have only grown a few centimeters, while some of my Acroporas and Montiporas have displayed absolutely amazing growth; in some cases 6-7 inches in less than 10 months. While I do not keep my calcium levels at outrageously high levels, my alkalinity and calcium have been very stable for the past year, and I feel this has helped fuel some of the growth that I have seen. 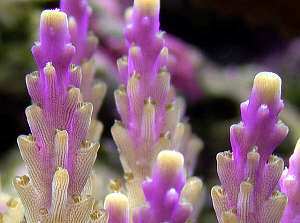 A growth sequence of this Acropora from 9/01 (above left) to the recent image on 8/02 (above right). 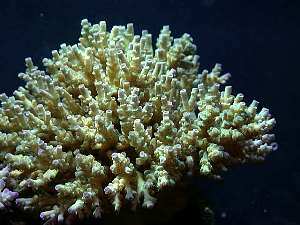 Another growth sequence of a Montipora from 10/01 (above left) to the recent image on 8/02 (above right). The fish are fed twice a day. I give them one cube of Mysis shrimp plus Spectrum Thera + A brand pellets (by New Life) in the morning. 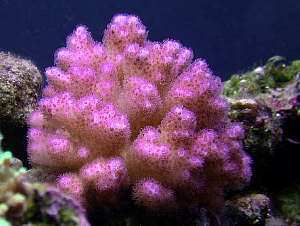 In the evening, they get one cube of Prime Reef and a cube of Ocean Plankton. About two times a week I soak their nighttime food supply with Boyd's Vita-Chem to help supplement vitamins, as well as to prevent disease. All my fish are very healthy and colorful. In addition, I add a piece of Seaweed Selects every day or two for the fish to munch on. I just attach it to a seaweed clip. Most of the fish love this stuff and go crazy when I add it to the tank. 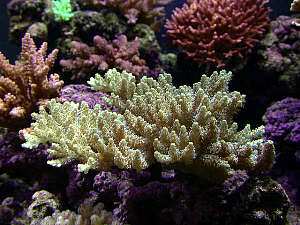 Corals and invertebrates are fed live phytoplankton and live rotifers daily. 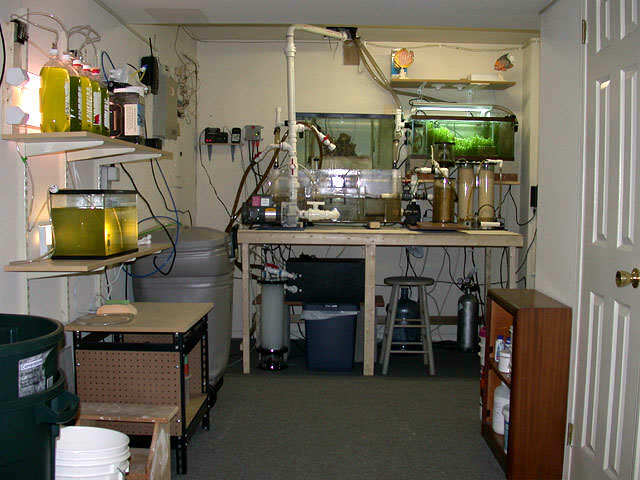 I give them 1 - 1 ½ cups of phytoplankton, and about 1 gallon of rotifers (sieved through a plankton net) added one half hour before the lights go off. I have been doing this for a few months and already have noticed a significant improvement. 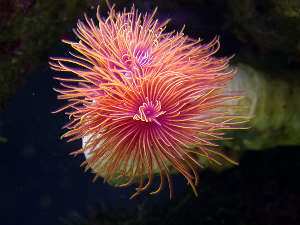 Visit my website www.cnidarianreef.com for more info and pictures.